Lots of homeowners see these conditions on their trees, especially American elms, and are alarmed. Slime flux or wet wood is a foul-smelling seepage of sap from the trunks of trees. It occurs in a wide range of landscape and fruit trees. This bacterial disease is not normally a serious problem if the tree is otherwise healthy. The infected wood is usually discolored or appears water soaked. Gas (carbon dioxide) is produced by the related fermentation caused by the bacteria. The gas produces pressure in the wood and forces sap from the trunk through cracks, branch crotch unions, pruning wounds, lawn mower wounds, other injuries and occasionally through unwounded bark. This oozing of sap is termed fluxing. The flux is colorless to tan at first but darkens upon exposure to the air. As fluxing continues, large areas of the bark become soaked. Many different microorganisms grow in the flux producing a foul or alcoholic odor. Various types of insects are attracted to the slime flux. Leaves on affected branches may be stunted and chlorotic. Grass may be killed where the flux runs down onto the grass. Sap may continue to ooze for several weeks or months, but usually it eventually stops with no treatment and no apparent damage to the tree. This slime flux may be triggered by heat, drought and other stress. Hydrogen peroxide injected into trees is the fast curative approach. The Sick Tree Treatment is the preventative and long term cure. Minimizing wounds and injuries is also important. More damage can be done to the tree in attempting to cure slime flux than the flux will cause. 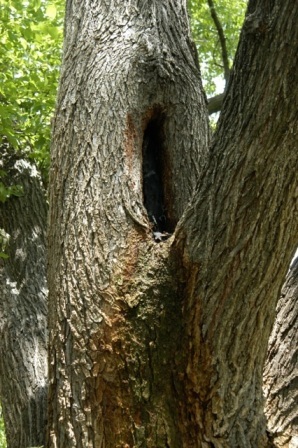 It has been a common practice with slime flux on American elms to drill a hole in the trunk and insert a pipe. This does not cure the problem. Inserting a pipe only allows the sap to drip on the ground rather than run down the trunk. This practice should not be done, does no good, adds further injury and wastes money. If there is loose or dead bark in the slime flux area, remove all of the loose bark and allow the area to dry. Do not apply wound dressing. If you have any questions on this newsletter or any other topic, tune in Sunday 8am -11am (CST) to the Dirt Doctor Radio Show. Listen on the internet or find a station in your area. The phone number for the show is 1 866-444-3478.